The Signature Fall Event for the Annapolis Rotoract Club is right around the corner! 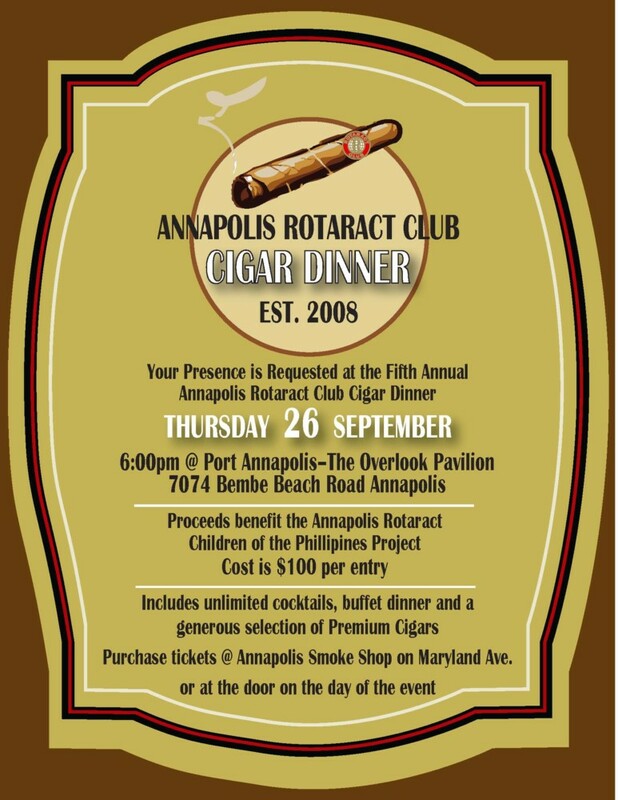 The Annapolis Rotaract Club’s Annual Cigar Dinner is set for September 26, 2013 from 6pm-10pm at Port Annapolis’s Overlook Pavilion. This year’s 21 and over event will feature catering by Luna Blu, live music by local musician Jonathan Stone, a 50/50 raffle, silent auction, top-shelf drinks and premium cigars from The Smoke Shop! All proceeds benefit their international service campaign, the Children of the Philippines, which provides supplies necessary for orphanages in Manila to care for the children.